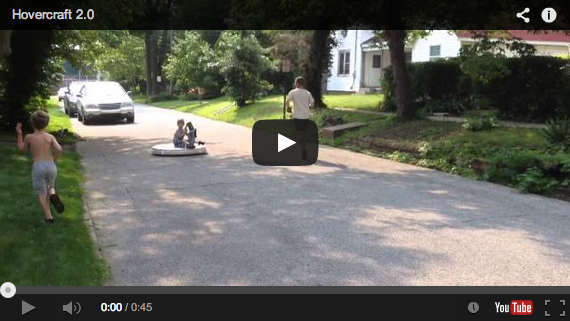 VIDEO-Homemade Hovercraft Puts Anything Your Dad Made To Shame. In a day and age where all kids want to do is spend the day playing video games in the house, parents have to think outside the box on what will actually get there kids out of the house. Well this dad did not only that, but he also raised the bar on awesomeness for all dads. 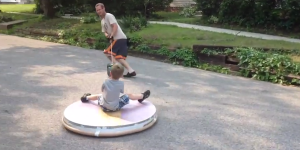 He decided that he would build a real-life hovercraft for his kids! In a video posted to YouTube under the username “Papa,” we see a kid riding around on this dad’s new invention and he seems to be loving it. I will admit that I wouldn’t mind having one at my house and I am quite curious on what went into actually building the contraption. It looks as though its powered by some type of small motor and in the description he says that he used a polystyrene insulation board as well. According to ViralViralVideos the motor is actually one that he had taken out of a hand vacuum. Now it doesn’t appear that there is any real way to steer this vehicle just yet, so for the moment the dad is using a rope to pull his kids around on it. I’m sure that the steering mechanics are coming next seeing as how this is the dad’s 2.0 version of the hovercraft.